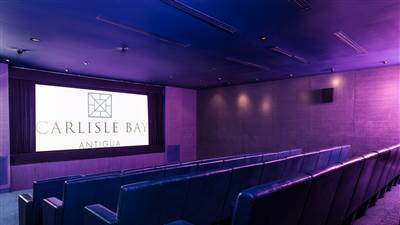 Available to hire for meetings and events our Screening Room is also used for movie nights at Carlisle Bay. Our guests can slide down into the blue Italian leather seats with popcorn in hand and lose themselves for a time. It has an authentic cinema feel and is stylish and classy – equally suited to the big blockbuster movie or the vintage black and white. Seating 45 people it is a state of the art multimedia venue with DVD projection, 5.1 Dolby digital surround sound and an adjustable screen (from widescreen to cinemascope). Naturally our screening room is popular with our corporate clients as an extra resource in staff incentive getaways, brainstorming trips and team bonding sessions.